Description: This excellent house it s not far away from the popular sea resort Albena. 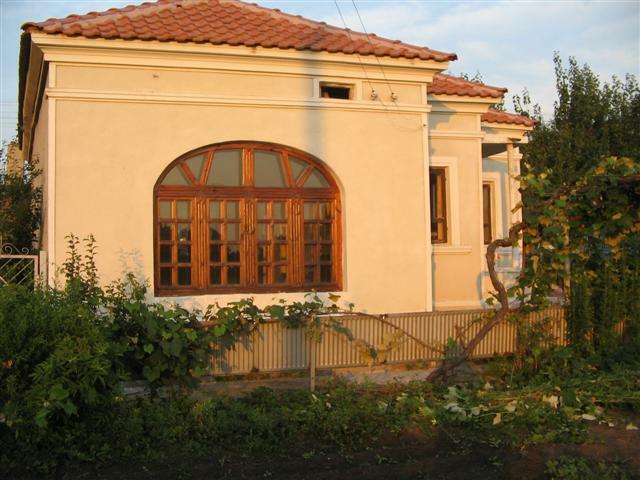 The house comprises 2 bedrooms, kitchen, dining room with fire place, bathroom/WC and room for sauna or another bathroom. The house is completely modernized, all of the living areas are finished with laminated flooring, with the bathrooms and corridors are finished with terracotta tiles. Connected to the property is mains water, electricity, septic tank, with telephone and ADSL Internet available. The property has been recently refurbished and it s in very good condition. The house has a new roof. The garden has about 20 of fruit trees including pear, apple and apricot and also has a 800 sq.m vineyard. The yard is very good maintained and there can be built a swimming-pool. The lovely summer days you can spend with many friends swimming and eating delicious dishes. The region is ecologically clean, there are all the amenities and communications needed. The area is known as a picturesque and quiet place with highest demand among both Bulgarian and foreign citizens. The village is nice and peaceful and provides a food-stores, a shop, a pub, school, a kinder garden, post office and a regular transport to Dobrich Town. Local people are warm and hospitable. The village is located 27km away from the VIP Albena resort and 46km away from the city of Varna and airport. The area is calm and suitable for outdoor activities. Albena resort complex is one of the most beautiful resorts on the Bulgarian Black Sea coast. The Black Sea coast offers a combination of marvelous conditions for sea tourism, rich cultural heritage and incredible nature. Here, in this area you will be able to enjoy both rural quietness and city comfort, besides by the sea coast! DON T MISS THIS GREAT OPPORTUNITY !